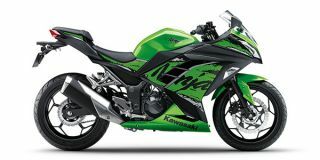 Kawasaki Ninja 300 price starts at Rs.2.98 lakh (Ex-Showroom, Delhi). The Kawasaki Ninja 300 is powered by a 296cc, liquid-cooled, parallel twin engine, which produces 39PS at 11,000rpm and 27Nm at 10,000rpm, mated to a 6-speed gearbox. The 300cc Kawasaki is equipped with 37mm telescopic front forks and a five-way adjustable gas-charged monoshock at the rear. The Ninja 300 rides on 17-inch wheels shod with 110/70 section front tyre and a 140/70 section rear tyre. Braking is managed by a 290mm petal disc up front and a 220mm petal disc at the rear, with ABS now as standard. Q. How is the mileage and service of bike? Does it vibrates or heats a lot? Please share your experience? Q. Suspension system is good for Indian roads? Q. Does it suitable for long rides? Q. I have a plan to buy Ninja 300, what is your experience with this bike?